Our ID card system experts will review your needs and send you personalized recommendations. How Do I Order Smart Cards? Can I Print on Smart Cards? How Do I Integrate New Card Technology? How Should I Display My Smart Cards? How many IDs will you print per year? Below you will find a range of card templates which you can download and customize for use with AlphaCard ID Suite software. 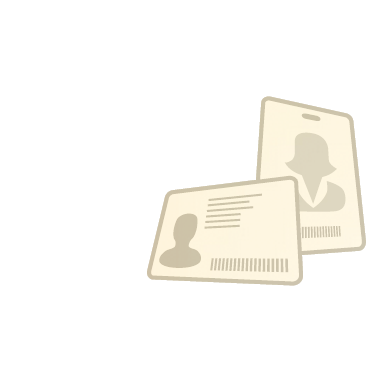 You can easily change, remove, or add text fields and images, and change colors, to fit your ID card needs. All designs shown here are single sided, but can be easily customized for dual-sided printing. See more information on customizing card templates in AlphaCard ID Suite. Please note these ID card templates are only for use with AlphaCard ID Suite software versions Standard, Professional, and Elite. If you want to learn more, try our software with a free 6-week trial. Click the Download .CTP file link to download the card template, and save it to your computer. Open AlphaCard ID Suite and go to the Configuration Menu at the top, then click Import Templates. A file browser window will pop up—navigate to the location you saved the .CTP card template file when you downloaded it, click on the file, and click the Open button. The template will be added to your AlphaCard ID Suite software in the Loaded Cards menu on the left side bar. Click on the new template in the Loaded Cards menu to view and configure the template. To learn how to change text fields, add your own logo, change the background images, or change the colors to match your logo, visit our AlphaCard ID Suite Design Help page. For help connecting this card template to your existing database, visit our Download and Database Connectivity Help page. Please note, these templates should not be downloaded with Internet Explorer or Edge web browsers. to give you a Free Needs Analysis. Copyright © 2016 AlphaCard. All rights reserved.